Yesterday one came to my balcony at the studio - for just long enough to know there would be no point reaching for the camera. More usual sightings are cameo appearances amid a clutter of branches or an overwhelming delight that is a charm of goldfinches making their way past you. On TwitPic I posted an example of how they seem to know where both your camera and the sun is, as if to ensure you won’t get a good photo (enlarge it when you get there). 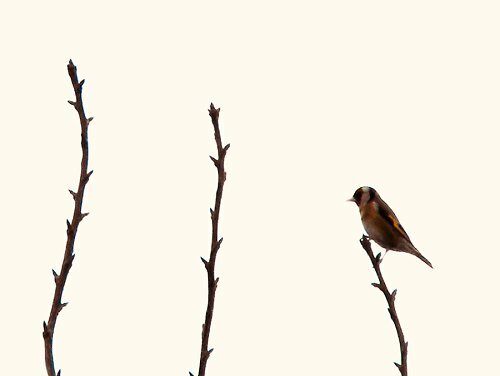 This photo of a goldfinch, taken in poor light, is the best I’ve yet managed. Beautiful from every angle, it’s really a side view that does them most justice, for unlike their American cousins of the same name, European goldfinches are not canary yellow over most of their bodies but take their name from the yellow bar on their wings. The outrageous flag that is their face and head combination of red, white, and black, is also best seen from the side. I do realise that outside the window I could hang some nuts and seeds to their liking, and then happily click away - but that’s not what I’m talking about. gorgois pic! I live near a nature reserve on the shore of Lough Neagh, an Eagle was in the garden last year! Possible from Donegal. Nice photo! They’re so lovely to look at. I like your “outrageous flag” description.